I have been teaching at Pleasant View Elementary for three years. 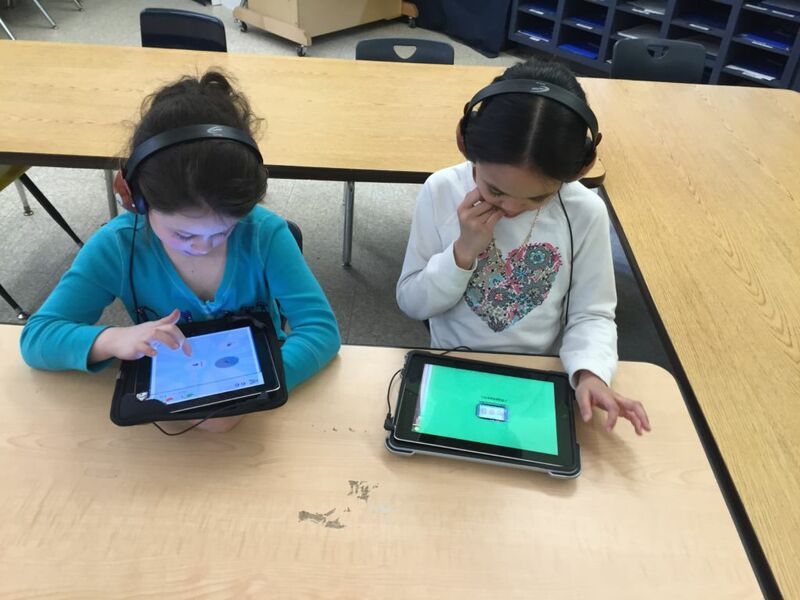 During my first year in the classroom, our school received a grant from the Rhode Island Department of Education to become the state’s first model school for blended learning. I started my journey in Pre-K, where I only had access to a few iPads with simple apps and a SMARTBoard. I tried to use the technology to make my lessons more engaging with simple interactive learning games on the SMARTBoard and math and literacy songs that the children sang along with. My classroom was fairly teacher-centered, but I was developing comfort with using these tools on a daily basis. 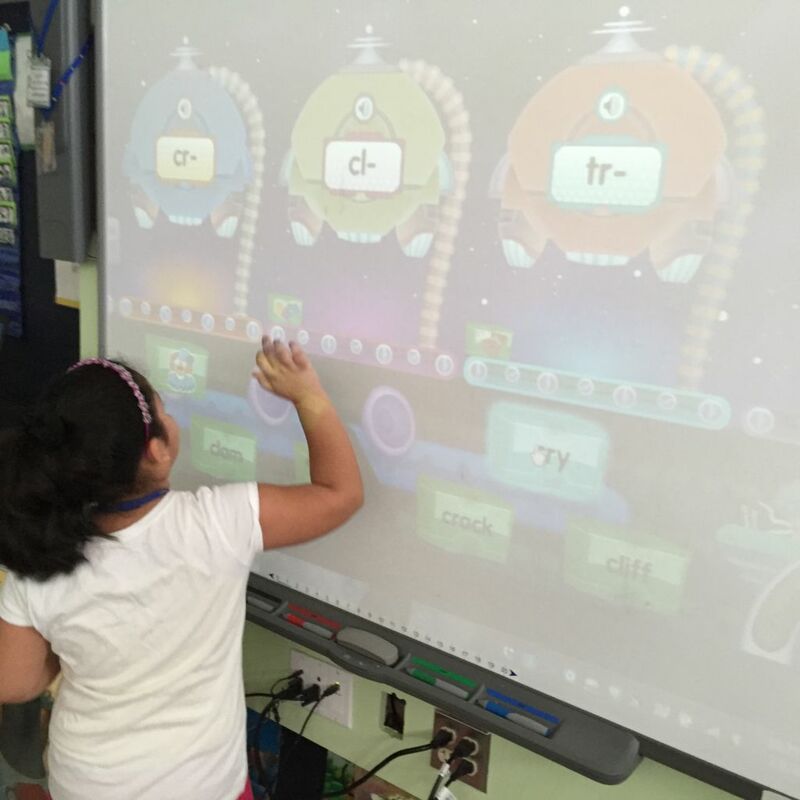 When I moved to kindergarten, during my second year, my co-teacher and I created interactive charts using the SMARTBoard. The purpose of these charts was to promote more independence during small group instruction by enabling the students to find their name and rotate to the correct station. We started regrouping students more often for targeted instruction and differentiation, but we were still doing a lot of whole group instruction for reading. In addition to the iPads and SMARTBoard, the children utilized laptops as they rotated through stations, working on a variety of educational softwares including Raz-Kids, Compass Learning, DreamBox and Lexia. These programs provided immediate assessment results, which enabled me to quickly and regularly adjust my instruction and groupings. In 2014, I looped with my kindergarteners and started working in Pleasant View’s first grade inclusion classroom alongside a new Special Education teacher named Alexandra. As we settled into the co-teaching model, things began to change and we created a classroom environment that looked dramatically different from what my students and I had experienced in previous years. What follows is a glimpse into our blended classroom and how we’re making differentiated instruction work for our students. To start, we rarely teach in a whole group setting during ELA instruction. Though we share one space, our first grade classroom is really more like four classrooms in one. We start each week with a pre-assessment through which we identify the students who have already mastered the skills we’re required to teach through our district curriculum. The students who pass our pre-assessments become our advanced level group for the week. These children are not required to sit through a teacher-directed lesson where they would be required to relearn already mastered skills. 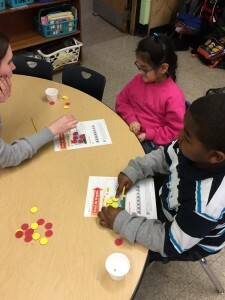 They work independently throughout the week at a table outside the classroom where they complete more challenging activities on their academic level that typically focus on fluency, comprehension, and writing. We leverage the application Blendspace to create playlists that allow these students to move through their advanced content at their own pace. Other teachers and school visitors are often amazed at the level of independence that these first graders show with no teacher directing their instruction from moment to moment. I find that the students like having this independence and responsibility. They are engaged and interested in the more appropriate tasks at hand. In order to make sure that the advanced group doesn’t miss any of the core content for the week, we make sure to give them practice activities to work on at home, specific small group instruction when working directly with a teacher, independent activities that are directly related to the weekly skills, and targeted feedback. While the advanced students are working independently, Alexandra and I are working with the remaining students, who are divided into three different groups depending on what level of need they possess in terms of mastery and accessing the content. Some of the students are working in small groups on interactive video lessons and activities that we build using Educreations. Educreation videos allow us to scale our teaching presence across the classroom so that each student can engage with the core content with scaffolding that is appropriate for them. Learning and practicing with the videos helps them develop confidence, allows them to work at their own pace, and builds independence. While this is underway, a third group of students is working with a teacher on the rug in front of the SMARTBoard. Many of the activities gathered for this group come directly from the Reading Street program and SMART Exchange, a great resource that allows us to download free interactive games and learning activities. This group benefits from having a teacher and cheerleader alongside them as they advance through the content and skills throughout the week. Working with a small group enables us to engage in ongoing formative assessment with our students. We know exactly who needs support and who needs to be challenged. The small group setting also leads to more student engagement as there is little waiting time, a variety of different interactive activities, and lessons tailored to their level of learning. In addition, there is a group in need of more intensive support working with Alex, the Special Educator. We have found that it is important to keep the same routine, but to mix up the activities within the routine to keep the level of engagement up. It is also imperative to use multiple forms of assessment and to switch groups frequently if needed. Once the routine is established, the children transition smoothly even with a little change as long as the station name you use for each breakout station stays consistent. For example, we labeled them SMARTBoard Group, Educreations Group, Blendspace Group, and the Building with Ms. Alex Group. After twenty minutes of working in differentiated break out groups, all of the children return to the rug for a whole group decodable reader from Reading Street. While one teacher is directing instruction on the SMARTBoard, the other teacher is setting up for station rotations and guided reading. Station rotations consists of two half hour small group sessions. For thirty minutes, half of the class works on some form of technology while the other half of the class works on an independent station or with a teacher. Then we turn off the lights to signal it’s time for the groups to switch. A technology station in which students work on laptops or iPads. They engage in either Compass Learning, Raz-Kids, Lexia, Reading Street, or a teacher created Blendspace playlist. Different software is assigned on different days and is targeted to meet the needs of the students at that center. The children also take their weekly Reading Street test on the computer during their technology rotation and take their Star Math progress monitoring assessment every other week on the computer during this time. We receive the results immediately and are able to modify groups, plan instruction, and alter interventions if needed based on the data the programs generate. The Osmo Center, where a pair of students look at a picture and then try to spell it together using letter tiles. The Osmo allows us to change the level of difficulty depending upon the group and is great for getting students to cooperate and collaborate around their learning. An offline playlist center in which we have four analog activities that correlate to the phonics skills, comprehension, spelling and conventions that Reading Street focuses on for the week. Once the students complete these activities at their own pace, they have free choice to work on the SMARTBoard with a friend, their poetry folder, a vocabulary game on the iPad called Free Rice, or one of many other hands on literacy centers. These activities are switched daily to keep the students excited and engaged. After the second rotation, we shut the lights off to signal it is time to transition and the entire class cleans up their station, logs of their computer, and moves to the rug for full-group reading comprehension. Upon completion of comprehension we always take a movement break and rock out to our favorite songs from GoNoodle. This multi-sensory environment–where students are shifting between small and whole group instruction, independent and paired practice, and interactive programs on the devices–results in increased engagement and more concrete learning. Ours is an inclusion classroom with students who are identified as having mild-moderate special needs. The beauty of our model is that because of the amount of small group and targeted differentiation that is happening across the classroom at any given moment, nobody in the room knows who the special needs students are nor who the special education teacher is. Everyone’s work is targeted to their needs and everyone is pushed at their own zone of proximal development. Every student is taught the weekly phonics skills, high frequency words, and conventions, but in a different manner depending on their needs and style of learning. I send home all usernames and passwords so children can continue to work on activities and playlists outside of school, either independently or with their family, and am continuously impressed by the time and effort students put in on “their time”. From my perspective, there are two key components to the success of this model. The first is the pre-assessment, which measures the student’s beginning of the week mastery of the core content and skills. We combine this information with a variety of assessment sources, from Reading Street weekly quizzes to adaptive software data to more formal STAR Math and Early Literacy data, to get a rich picture of student learning. The second is creating the “Breakout” groups for the week based on the pre-assessment data. This allow us to do a lot of hands-on word building and multi-sensory activities with the students, as opposed to having students sit for long periods of time listening to a teacher-directed lesson. The growth that these students have shown through this model is incredible. In just one year I have seen students advance from identifying the letters and sight words to fluently reading second grade leveled readers. It is because of this growth that I have witnessed with my own eyes that I would never go back to a traditional, teacher-centered classroom. The use of educational technology has enabled us to provide a truly differentiated learning experience for our students.